Water availability is increasingly seen as a crucial factor in achieving food security, better livelihoods and sustainable development in rural areas. Integrated Water Resource Management (IWRM) has gained international recognition as an appropriate framework for meeting the challenges of water scarcity. IWRM is fully supported by the Swiss Agency for Development and Cooperation (SDC), where experts asked themselves how they and their partners could learn together and in an innovative and forward-looking way from the wealth of existing experience in water and watershed management. 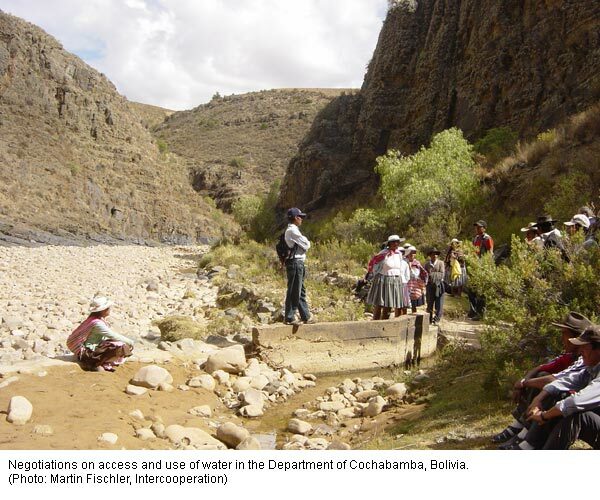 This question triggered an initiative named “Capitalising on Experiences – Water, Land and People”, which is currently being implemented in Bolivia, India and Mali. In each of the three countries, a learning group of 12 to 15 participants from different sectors – farmers’ and water users’ associations, project teams, NGOs, private sector, government, SDC staff – jointly defined a learning agenda (topics and learning process), thus creating local ownership of the initiative and its results. The topics addressed varied from country to country, ranging from water governance, community organisation, participatory planning of local water management and watershed development to gender and equity issues. The selected topics were deepened and prioritised using story-telling as a tool that ensures a high level of authenticity while capturing experiences. Members of the learning group and other local actors (“experience holders”) were invited to learning events where they narrated their experience (tell their story) in relation to a specific topic. Participants and facilitators appreciated this innovative tool for enabling them to break with the usual formal setting, see complex issues from previously unperceived angles, and challenge fixed mindsets. However, participants also identified limitations of the tool. For example, they found it difficult to communicate the essence of stories to others who had not participated in the story-telling sessions; a lack of trust among participants sometimes prevented them from being entirely sincere; facilitation proved rather demanding; and the tool generated little outcome in terms of quantitative information. The learning groups concluded that the learning process was most effective and motivating when intermediate results were immediately put to use as inputs for decision- making in other ongoing initiatives, (as opposed to working in isolation to achieve a final product). In India, the learning group was consulted by the authorities and thus contributed to the elaboration of revised watershed guidelines. The three learning groups exchanged and presented their preliminary findings during the 4th World Water Forum in Mexico City in March 2006. Moreover, each learning group presented its findings in an innovative and attractive manner, working video, audio and power-point presentations as well as short stories and comics into interactive presentation CDs. These country-specific documentations were then partially translated and assembled to form a global product that is now available on DVD as well as on the Internet. This final product provides a rich resource base and is meant to be used by many actors on different levels, ranging from local stakeholders (e.g. water users’ associations and authorities), the SDC and partner institutions to policy-makers and the wider public. While many governments place great hopes in producing energy from biomass, opponents voice their concerns with increasing urgency. They point out, above all, that energy crops compete with food crops for limited land and water resources; moreover, in many cases biofuels have a negative energy balance. The author of this publication adds an aspect that usually receives less attention: He hypothesises that large-scale production of energy crops contradicts the principles of sustainable organic agriculture in a very fundamental way. In particular, he argues that organic agriculture seeks to operate within closed nutrient cycles: nutrients extracted from the soil are returned by applying compost, mulching or manuring. By contrast, according to the author, in energy crop production nearly 100% of the biomass leaves the farm, making it necessary to bring in external inputs to counter the risk of soil fertility degradation. Small-scale use of biomass as an energy source – e.g. of biogas from organic material which is then brought back to the fields in the form of compost – certainly can make sense. The global energy problem, however, cannot be overcome by shifting to biofuels. The only way to meet this challenge is to reduce energy consumption. After several years participating in voluntary carbonoffset plantation projects, communities in Ecuador have started to voice their concerns. They have drawn up a list of 15 specific complaints, which include a lack of information concerning the costs of the project, the payments they would receive, the relevant legal aspects, as well as their rights and obligations, not to mention failures to honour promises of employment and payment. In the Kyoto Protocol, deforestation prevention policies, such as “avoided deforestation (AD)”, use economic incentives to encourage tropical countries to protect their carbon reservoirs in standing forests. These topdown measures involve astronomic sums of money, which are often not shared with the local communities. If avoided deforestation does not take due account of the priorities of local communities, it could lead to increased external control of forests by “experts”, unjust targeting of indigenous peoples as drivers of deforestation, as well as the violation of customary land and territorial rights, to name but a few of the possible risks. How then can these communities also share in the advantages offered by avoided forestation programmes? Suggestions include non-monetary benefits to communities with subsistence economies or small payments transferred into community funds. Above all, though, direct participation in national and international debates, will help ensure that indigenous peoples enjoy the benefits generated by AD programmes. Experiments testing sustainable agricultural production technologies in southern Africa resulted in crop yields that were up to ten times higher than the average yields. However, successful research results often fail to find their way from the test plots to the farmers’ fields. On the contrary: soil degradation and the impairment of related ecosystem services continue, causing yields to stagnate or diminish even further. A publication entitled Saving Africa’s Soils investigates the reasons for this. Among other things, political and economic factors prevent full exploitation of the potential. However, the greatest challenge is seen in the persisting knowledge gaps regarding land use and land quality. Data are satisfactory only within limited contexts; they often have small spatial scopes, and only rarely are they actually integrated into agricultural and environmental policies. The authors present a detailed research agenda for the following research areas: soilbased production constraints, integrated soil fertility management, soil ecosystem services, and adoption of sustainable land use technologies. Future agricultural research will require experts who work in a multidisciplinary manner and are capable of introducing their findings into policy dialogues. This capacity, however, is drastically decreasing. Soil laboratories in Africa are being shut down, and the number of students in agriculture is dropping. The question of how farmers can be involved or how they can benefit from the proposed research agenda is left unanswered. This well-to-the-point report describes obstacles and challenges that yet need to be overcome in the process of formulating and implementing a comprehensive strategy to combat desertification. Instead of seeing drylands mainly as problem regions, the authors also highlight specific potentials that are found in these areas and need to be tapped more efficiently. This holistic view emphasises the importance of taking a multi-stakeholder approach to desertification, involving a wide range of actors including the local population, representatives of various professions and both genders, local and national NGOs and private actors, as well as governments and international organisations. Furthermore, a high priority is given to cross-regional cooperation between groups of countries that face similar ecological, social and economic challenges, as well as cooperation between the various international environmental agreements. Along with numerous other aspects, the report also investigates the positive and negative impacts of incentives and the processing and combining of traditional knowledge and research results. Despite its positive keynote the report leaves no doubt that there is much left to do for decision-makers, both in dryland areas and in countries that have so far only indirectly been concerned by the problem, before it will be possible to implement an efficient strategy. This publication does not address experts in development cooperation, nor does it present new approaches or tools for water management. Instead, it pursues the aim of sensitising those whose life will be most strongly influenced by both positive and negative developments in the water problem: young people. This novel type of summary of the Human Development Report 2006 (Beyond scarcity: Power, poverty, and the global water crisis) has been written by young authors for young readers. The key facts were complemented with personal stories, pictures, and poems, thus offering an understandable and immediate approach to the manifold aspects and complex interrelations within the topic. In doing so, the publication follows the objective of the “United Nations Decade of Education for Sustainable Development (2005–2014)”, which is to promote educational and learning processes that encourage improvements in human behaviour towards the environment. 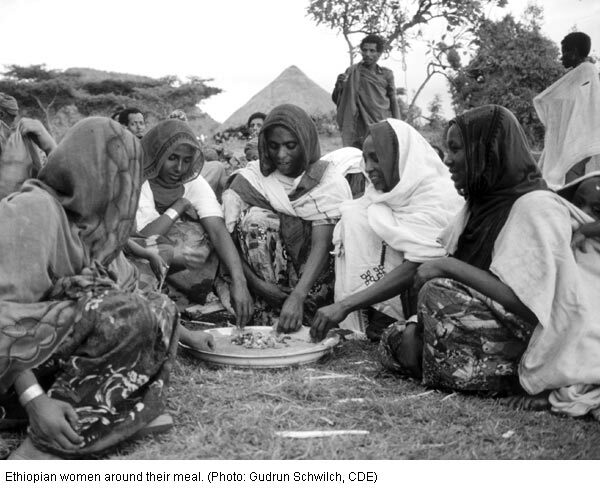 Hunger is predominantly a rural phenomenon. 615 of 854 million undernourished people depend on rural livelihoods. Many developing countries face the challenge of feeding a growing population, at a time when natural resources are used to their limits and ecosystem services are at risk. With this in mind, the Swiss Agency for Development and Cooperation (SDC) stresses the importance of sustainable and multifunctional forms of agriculture. The main aim is to foster forms of agricultural production that generate income for small-scale farmers and ensure food security, while respecting local ecological, social, cultural and economic conditions. Achieving this goal requires interventions and efforts on various levels, including implementation of national and international policies that give a high priority to food security; promotion of investments in rural development; facilitation of access to important production factors, such as land, new technologies and markets, for small-scale farmers. This publication uses concrete, well-illustrated project examples to show where and how the SDC is confronting these challenges. In doing so, it highlights the SDC’s broad efforts in support of rural areas. The aim of this assessment is to answer the following question: Are the incentives created by communitybased natural resource management (CBNRM) in Asia sufficient to ensure the long-term engagement of communities and to reduce poverty? Given that the concept first emerged at the end of the 1990s, the assessment was able to draw on the experiences of developing countries that have been actively practicing CBNRM for close to ten years. 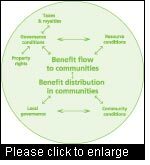 A unique analytical structure was created to identify the benefits which communities derive from such an approach as well as how these are redistributed. Benefits can be both monetary (the sale of resources or paid employment in wood-processing companies) and nonmonetary (access to non-wood forest products). However, it should be noted that costs also have to be borne in relation to the organisational aspects of CBNRM. In Vietnam, the Land Law of 2003 and the Forest Protection Law of 2004 for the first time recognised communities and villages as potential recipients of forest allocation. The project “Extension and Training Support Project for Forestry and Agriculture in the Uplands” (ETSP) piloted the allocation of natural forest in three provinces. Consequently, the country as a whole was able to benefit from these experiences and lessons learnt from the project. The report issues a series of recommendations, some of which are aimed at the communities in terms of the natural resources at their disposal, while others are targeted directly at decisionmakers and politicians. Communities play a key role in determining potential risks to disasters such as earthquakes, hurricanes and drought, but also epidemics and conflict. Communities also hold a key function in identifying the most vulnerable population groups. Involving communities in planning and implementation processes is indispensable to design effective risk reduction and prevention measures. Based on this insight, a great number of different me - thods and tools for risk assessment as well as for planning and implementing risk reduction and prevention measures have been developed during the last two decades. A website entitled Community risk assessment toolkit offers an easy way to make out the most appropriate me thods for a given community. Launched just over one year ago by Pro Vention, the website has continually been enhanced to include more precise search options and more detailed descriptions of the numerous methods and case studies recorded in the database. As a result, the website now enables interested organisations – communities, NGOs, donors, and others – to find detailed information tailored to the specific type of risk, target groups, geographic focus, type of assessment, and other characteristics of a given situation. The database is continually expanded to include new methods and case studies. 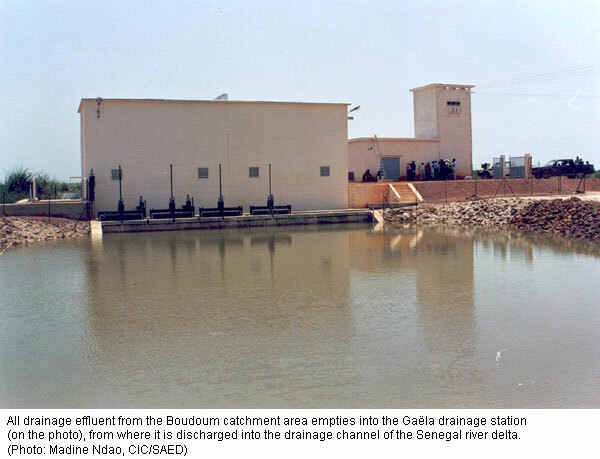 Since Senegal became independent in the early 1960s, the Senegal River delta, covering an area of around 4500 km2, has been irrigated to enable intensive rice and sugarcane cultivation. Along with irrigation came the use of pesticides and fertilisers. Ever since, agrochemical residues have been accumulating in the soils and water bodies of the delta. M. Boubacar Cissé reports in his PhD thesis that, in the meantime, the concentration of agrochemicals has reached a level where the natural drainage systems can no longer cope. The government has reacted by building a 65 km long drainage channel leading into the ocean. The channel is meant to carry the toxic substances away from the nearby national park towards the sea, thus cleansing the flat area of the delta which is no longer sufficiently purified by natural leaching processes. Improvements have already begun to show, but at the same time new problems are emerging: cutting through biological corridors, the channel represents an obstacle for animals and exposes them to heavily polluted water. Moreover, contamination is not eliminated but merely shifted towards the coast. The fact is that while intensive cultures produce higher yields, in many cases they also incur high costs and entail unpredictable consequences. 98 percent of Kenya’s farms are run by small-scale farmers. Poorly adapted and inappropriate land use technologies are a frequent cause of low productivity and are thus one of the factors responsible for food insecurity. This was the entry point for a study carried out by the United Nations University. The authors investigated the reasons preventing farmers in Bondo District from adopting improved technologies. Fields are cultivated manually, sometimes using animal traction. However, poor farmers cannot afford draught animals, and owners of small plots cannot use them due to the limited space. Furthermore, the results showed that adoption of improved technologies depends on whether the household is headed by a man or a woman and on whether they are married, divorced or widowed. While access to animal traction in itself is not linked to gender, women face more difficulties than men in accessing cash and training and are often confronted with general social prejudice. The authors demand more awareness of gender issues and training for women. However, it appears that overcoming gender-related differences also requires changes in the overall socio-cultural setting. Source: Gender Differentiation in the Analysis of Alternative Farm Mechanization: Choices on Small Farms in Kenya. Julliet Wanjiku, John Uhuru Manyengo, Willis Oluoch-Kosura, and Joseph T. Karugia. Research Paper No. 2007/15. United Nations University, UNU-WIDER, 2007. 23 p.